In the first part of the project, the ESR is seconded to RUB for Assembly of a new two-enzyme cascade with in situ cofactor (alpha-ketoglutarate) generation from inexpensive L-Glu. The ESR will be introduced to the handling of the AAHs and clone a series of novel hydroxylases with 3- and 4-specificity. At InnoSyn, the ESR will investigate different enzyme formulations (cell-free extract, growing cells, resting cells and immobilized enzyme) and proprietary fermentation methods from InnoSyn for the conversion of commercially interesting branched-chain amino acids. 2. In the first part of the project, the ESR is seconded to RUB for Assembly of a new two-enzyme cascade with in situ cofactor (alpha-ketoglutarate) generation from inexpensive L-Glu. The risk contingency plan is to perform deamination of L-Glu with inexpen¬sive pyruvate as acceptor, and then to add L-amino acids as substrates for hydroxylation. This set-up is less elegant, but avoids cross-reactivity and still substitutes expensive KG with ten-times less expensive L-Glu. The ESR will be intro¬duced to the handling of the AAHs and clone a series of novel hydroxylases with 3- and 4-specificity. 3. 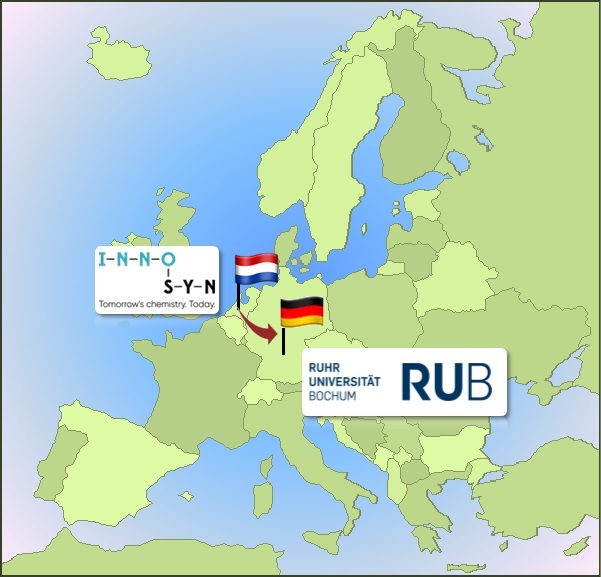 At InnoSyn, the ESR will investigate different enzyme formulations (cell-free extract, growing cells, resting cells and immobilized enzyme) and proprietary fermentation methods from DSM for the conversion of commercially interesting branched-chain amino acids. The best reaction setting will be scaled-up to 50 g scale for a cost-benefit analysis (TRL4).